Pope St John Paul II introduced five new Mysteries of Light to the traditional fifteen decades of the Rosary in 2002. As the Diocesan Shrine for the Holy Rosary, we hope to provide a beautiful and accessible space for the praying of these Mysteries, and for quiet contemplation. We are delighted to share our plans for the Luminous Mysteries Garden, which will be situated in the derelict grounds behind the Lady Chapel. 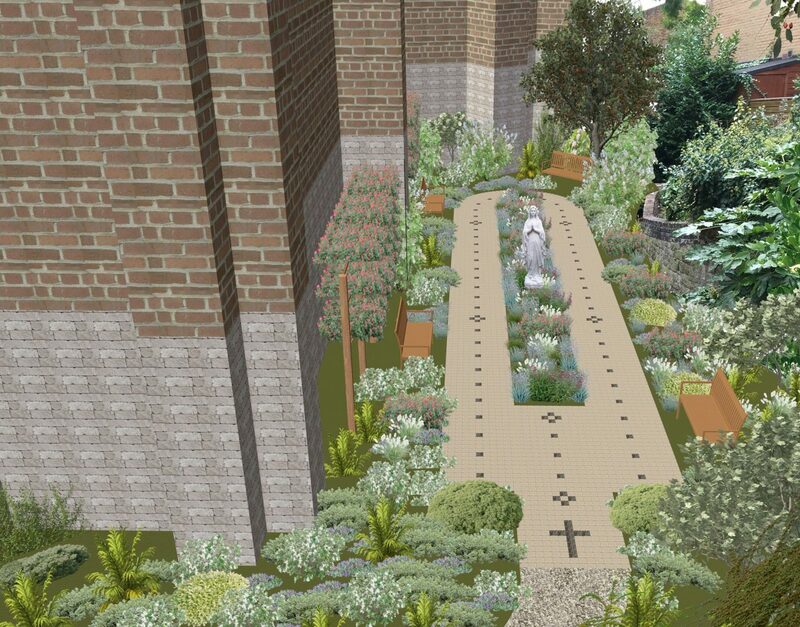 The garden will feature a Rosary-shaped path, encircling artistic representations of the Mysteries of Light, plants in honour of Mary, and a newly-commissioned statue of Our Lady. With your help and contributions, we hope to begin work in January 2019 with a view to opening the garden on the feast of St Dominic, 24th May 2019. You can choose to sponsor one of the following. All gifts will be recorded in a special Book of Dedication. A specially commissioned statue of Our Lady of the Rosary will be the focal point of the garden, with your choice of dedication. Four benches can be sponsored, and display a dedication of your choice. Ten spotlights will be needed altogether to create a path of light for the Luminous Mysteries Garden. Your gift will purchase one spotlight. You can sponsor each of the 88 stone setts used to mark out the prayers of the Rosary. Your gift will go towards the trees and shrubs we will use to create a beautiful frame for the garden with carefully planned plantings. Your gift will contribute towards the flowers and plants specially chosen to honour Our Blessed Mother, including roses, lilies, irises, and other symbolic flowers. You can donate now using the secure form below, or using one of the leaflets in church. If you would like to donate in other ways such as via bank transfer, please email development@english.op.org.